Harden's Guides have been compiling reviews of the best restaurants in Horndon On The Hill since 1998. 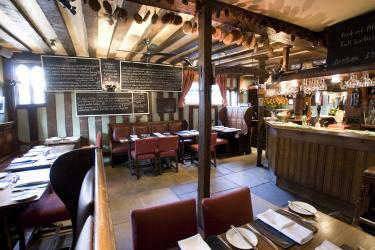 Hardens guides have spent 15 years compiling reviews of the best Horndon On The Hill restaurants. On Hardens.com you'll find details and reviews of 1 restaurants in Horndon On The Hill and our unique survey based approach to rating and reviewing Horndon On The Hill restaurants gives you the best insight into the top restaurants in every area and of every type of cuisine. “The old pub oozes charm and when cold, the roaring fire near the bar is just the thing”, say fans of this timber-framed 15th-century coaching inn. “Then there’s the food: fantastic, but not so fancy it would put the man in the street off, and it’s in generous portions”. Run by the same family for 75 years, it’s a place where tradition is taken seriously – a Good Friday custom of adding a new hot cross bun to a collection hanging over the bar is more than a century old. “We’ve been regular diners for the past 25 years and it never fails to deliver – the regularly changing menu means you never get bored”. These are the top restaurants in Horndon On The Hill based on reviews by Hardens users.